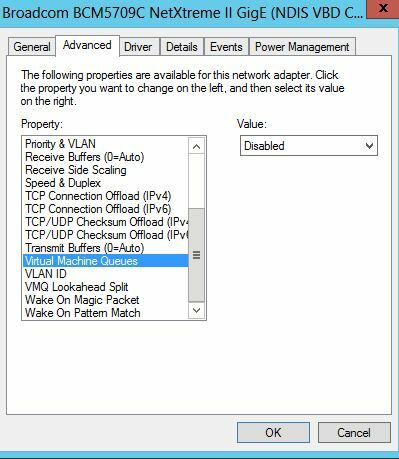 I found a strange issue today affecting HyperV when you are using a Broadcom NIC as the vSwitch NIC – and that is that transfers from within the VM to another part of the network – those transfers are crazy slow. This is a “bug” in the Broadcom driver and has to do with a network feature on Broadcom NICs. To fix it, just disable “Virtual Machine Queues” in the Advanced Configuration dialog – this is for the dedicated NIC and NOT vEthernet.